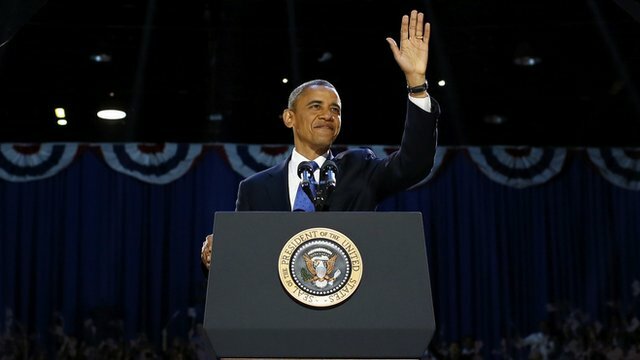 President Barack Obama told cheering supporters at his campaign headquarters in Chicago today that "the best is yet to come" for the United States as he stormed to a second term by defeating the Republican Mitt Romney. We want our children to live in an America that isn’t burdened by debt, that isn’t weakened by inequality, that isn’t threatened by the destructive power of a warming planet. We want to pass on a country that’s safe and respected and admired around the world, a nation that is defended by the strongest military on earth and the best troops this — this world has ever known. But also a country that moves with confidence beyond this time of war, to shape a peace that is built on the promise of freedom and dignity for every human being. This country has more wealth than any nation, but that’s not what makes us rich.We have the most powerful military in history, but that’s not what makes us strong. Our university, our culture are all the envy of the world, but that’s not what keeps the world coming to our shores.